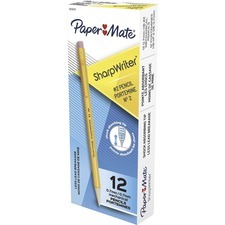 Paper Mate Sharpwriter Mechanical Pencil - Pencil Grade: #2 - Lead Size: 0.7mm - Barrel Color: Goldenrod - 12 / Dozen - Welcome to TABS! Unique twist-to-advance mechanism makes the Sharpwriter No. 2 Mechanical Pencil simple to use. Use the simple twist action to advance and retract lead. Shock-absorbing cushion tip adjusts to writing pressure to reduce lead breakage. Mechanical pencil offers a convenient pocket clip to attach to pockets and notebooks. Unique twist-to-advance mechanism makes the Sharpwriter No. 2 Mechanical Pencil simple to use. Use the simple twist action to advance and retract lead. Shock-absorbing cushion tip adjusts to writing pressure to reduce lead breakage. Mechanical pencil offers a convenient pocket clip to attach to pockets and notebooks. Nonrefillable. Weight: 0.00 Manufacturer: Sanford, L.P.